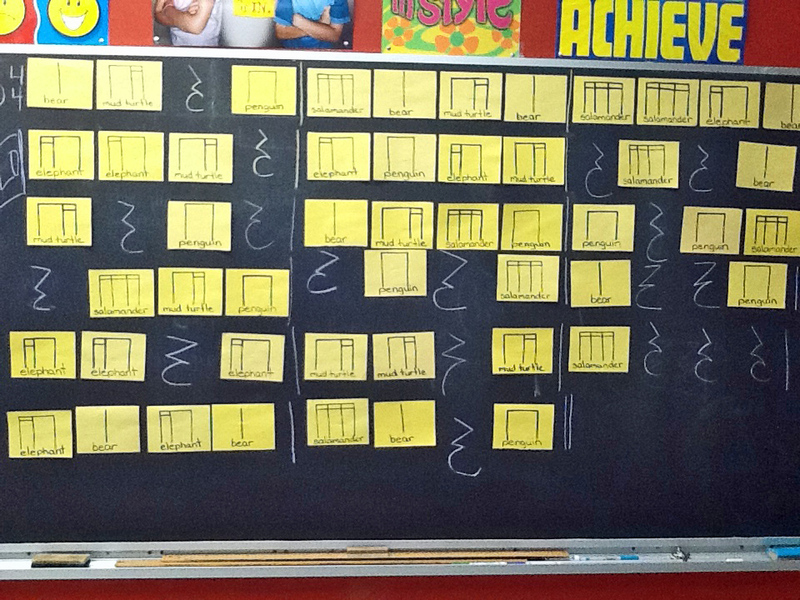 We've got some rhythm going on in our classroom right now! OK - so maybe we're not dancing around the classroom yet - but considering I've still got over three weeks to go, that could be a good thing. 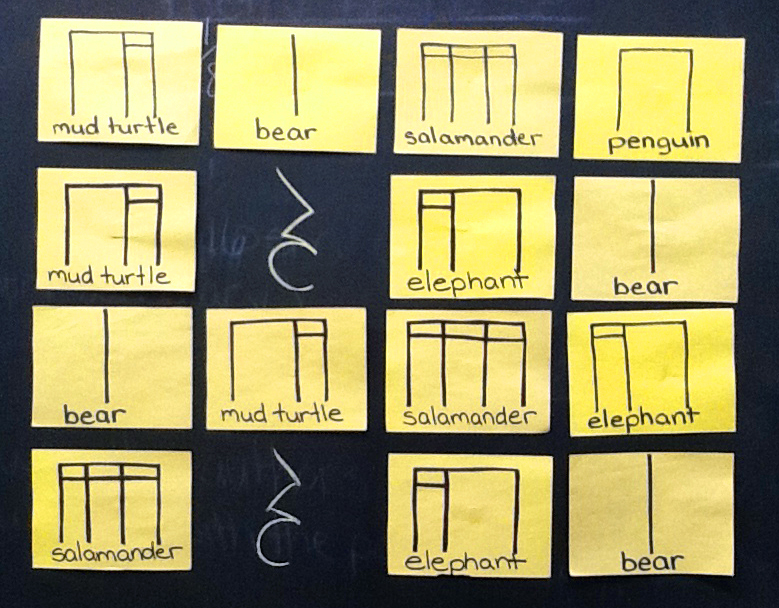 I made these rhythm cards years ago, and use them every year when I teach music. Each card represents one beat of music, and each stick is one syllable (or clap). 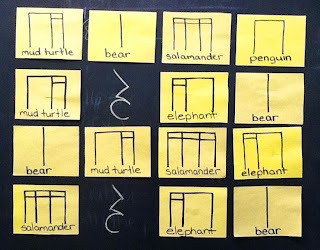 The words are pronounced and clapped just like they would be said in every day talking - so, penguin has two equal parts, mud turtle has the emphasis on the first syllable, elephant has the emphasis on the last syllable, etc. But because each card is only ONE beat, the four (equal) syllables for salamander must be done in the same time it would take for the one syllable (clap) for bear. Did I explain that well enough? (I know many of you that teach music use the "ta ta" or "ti ti", but I like using these words because it ALWAYS works with my classes. I've added a magnet to the back of each card so we can use them on the black board or any magnetic surface. We started by practicing a few patterns as a whole class - because the cards have magnets on the back, it's easy to switch them around. I also introduced the one beat rest (quarter rest). We talked about a measure of music (the number of beats in a bar), and worked with some 4 beat measures (a 4/4 time signature). 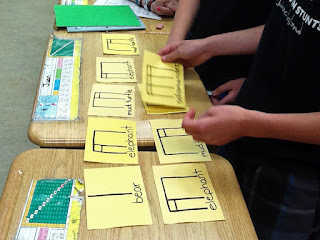 We also had a lot of fun figuring out what rhythm patterns our names were - mine (Jennifer) would be an elephant ... figures <sigh>. I keep my rhythm cards in baggies with about 10 - 15 cards in each baggie. 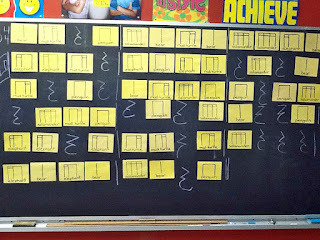 I divided my class into groups, and let each group make a few rhythm patterns to practice. They got to perform (by clapping) their rhythm patterns for the class. 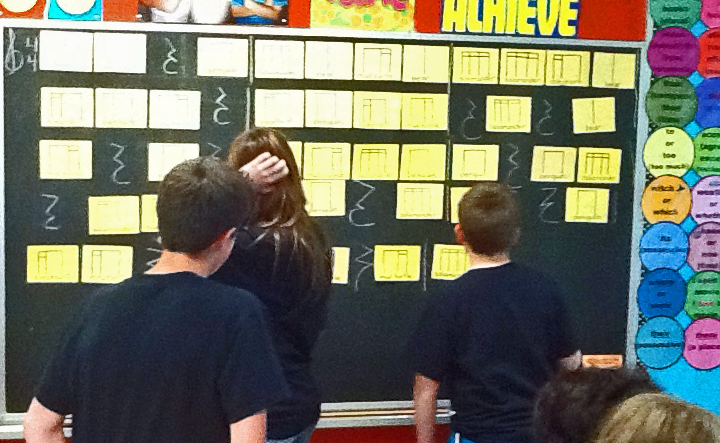 I then invited each group up to the black board to start making a large rhythm pattern with 4 beat measures. Each group came up and added to what the previous group had done. 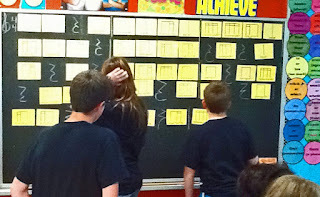 Before a new group could add their cards, they had to clap the rhythm pattern already made on the blackboard. At the end we had a WHOLE SONG! A whole song composed by my class. FABULOUS!!! We practiced it a few times, had a few laughs, and practiced it a bit more. Tomorrow we are going to integrate our poetry writing by creating a rap to go along with our rhythm pattern - I did stress that only appropriate lyrics will "fly", but I'm not that nervous ... it's going to be so much fun! I'm going to record their raps on my iPad - watch out, Grammys ... here we come! Love, love, LOVE this! Such a fun way to learn a music skill-and then adding the poetry/rap to it-seriously awesome! Neat idea! We do bucket drumming in our class. It's similar in that each rhythm has a name as well (pizza pie, alligator etc). They love it! Ahhh - this is fabulous!! Make sure you post pictures...or audio! of their raps!! SUCH a great lesson! You've been pinned! My daughter just asked to learn how to play the piano so we will be including that in our homeschool studies. Thanks so much! I love the words! Ta ta ta or ti ti ti can get confusing if you "lose your place." Plus words do have rhythm and so you're teaching meter (poetic) as well I think? Thanks for sharing all of your wonderful ideas! Love your site! I have purchased some great stuff from you at TPT.